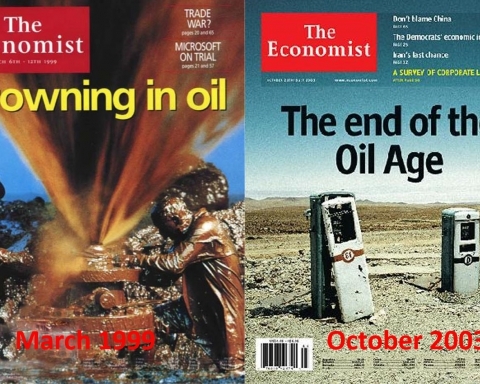 The term “Peak Oil” was used for the first time in January 2001. It was then that Colin Campbell wrote his first newsletter for ASPO, the Association for the Study of Peak Oil and Gas. A month later the “Focus” (Brännpunkt) the Op-Ed column of Svenska Dagbladet, Sweden, published the first debate article on Peak Oil. In the debate that followed, Tommy Nordin, the then head of the Swedish Petroleum Institute (now the Swedish Petroleum and Biofuel Institute) advanced the view that we did not need to worry about Peak Oil since huge oil sand resources exist. When the Global Energy Systems research group was founded ten years ago at Uppsala University, research into Canada’s oil sands became one of our first projects. The initial scenario for the analysis was maximal production where economic conditions were not a limiting factor. Such an analysis had been sought in a report to the US Department of Energy. In the book “Peeking at Peak Oil” I compare our analysis with what the International Energy Agency (IEA) regarded as possible future production in their World Energy Outlook report of 2011. For 2020 (that we will discuss in more detail below) we predicted 3.8 million barrels per day (Mb/d) and the IEA 2.7 Mb/d of production from Canada’s oil sands. It can be compared to the world’s current total oil production of 83 Mb/d (according to BP Statistical Review of World Energy). Production of bitumen is currently 1.7 Mb/d, and the IHS CERA report states 3.2 Mb/d as a possible level of production in 2020. That is less than our estimated maximal production level but more than what the IEA estimates. Alberta, where oil sands are mined, lies east of the Rocky Mountains but still lies in what is regarded as western Canada. Currently, there are pipelines with limited capacity to Vancouver and the Midwestern USA. The pipeline limitations have meant that increasing amounts of oil sands products are moved by rail, but the transport capacity of rail cannot be compared with that of pipelines. 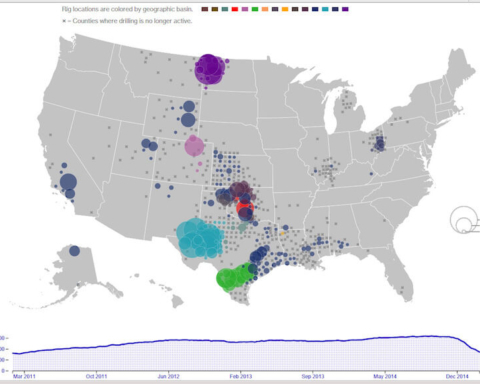 At the moment there are several projects underway to increase pipeline capacity. One is the second pipeline to Vancouver and a new one that is to pass through the northern part of the province of British Columbia, the “Enbridge Northern Gateway.” Another is the controversial Keystone XL pipeline to the USA and the Gulf of Mexico. Last year President Obama blocked the Keystone XL project, and we will see if he changes his mind this year. The oil transport capacity of rail will also increase. If all these projects are completed then by 2020, it would be possible to transport 2.4 Mb/d to refineries in the USA and other nations. However, to reach 3.2 Mb/d additional pipelines are required. At the same time as IHS CERA confirms this, they also note that shale oil will not make the USA independent of the need to import oil. Production from the Canadian oil sands will also be needed in the USA. Approximately one-third of oil sands production is consumed in Canada, and 80% of exports end up in the American Midwest. The rest of exports from the oil sands are distributed to other markets in the USA. 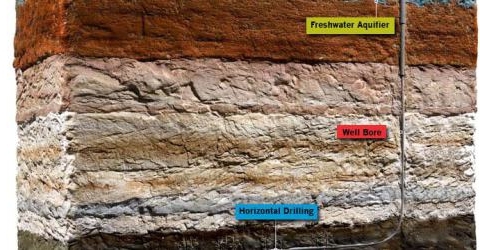 The products that come from the oil sands are so unusual that the capacity to refine them in US refineries is limited. Previously, every upgrading of refineries in the USA has increased the capacity to handle Canadian oil sands products, but the rise of shale oil will change this pattern. The Gulf of Mexico coast of the USA has the world’s largest refinery capacity at 8.6 Mb/d but in 2011 only 0.07 Mb/d of this refinery capacity was used for the Canadian oil sands products that reached this area. If all the projects to increase the flow between Canada and the Gulf of Mexico go ahead, then there will be the future potential to refine 2 Mb/d, but the eventual reality will probably be somewhat lower. The region’s refineries can accept 2.4 Mb/d of such heavy oil and currently 2 Mb/d of this oil is imported from Mexico, Venezuela, Columbia, and Brazil. Thus, the spare capacity for refining oil from the Canadian oil sands is only 0.4 Mb/d. Greater volumes from Canada’s oil sands means that imports from other parts of the world will decrease. The refineries on the US west coast already accept the maximum amounts of oil sands products that they can. The conclusion is, therefore, that refinery capacity limits the possibilities for expansion of importation of Canadian oil sands products into the USA. The rest of the world has limited possibilities to accept oil sands products since this would require the building of new refinery capacity. In principle, today it is only China that plans to expand its refinery capacity. Together with Venezuela, they are already planning a refinery that will be able to accept 0.4 Mb/d of Dilbit from Venezuela. China has large interests in Canada’s oil sands and is also willing to finance the Enbridge Northern Gateway. It can take 0.5 Mb/d of Dilbit to harbor on the west coast. If construction of the pipeline is stopped, this will have consequences for future refinery construction in China. To return to the beginning of this article, we should reassess the statement that the oil sands will save us from Peak Oil. 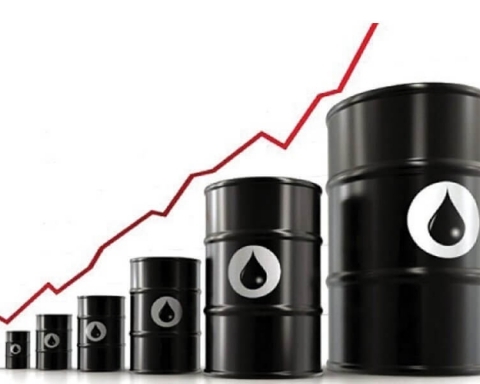 As early as 1998 Colin Campbell and Jean Laherrère stated in an article in Scientific American that global crude oil production would reach a maximum in around 2005. 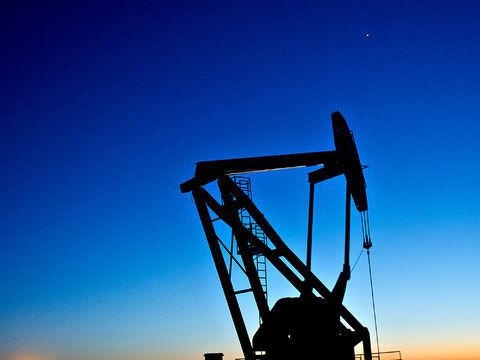 The IEA now considers that conventional crude oil production reached its maximum in 2008 and that it will decline by 2035. We, the IEA and IHS CERA all agree that crude oil production from currently producing fields is declining by 4 Mb/d per year and that the oil industry will not be able to compensate for this decline in new conventional crude oil production. We see that the total of current production and planned new production from the Canadian oil sands gives a level of possible production in 2020 of 3.2 Mb/d. It means that 15 years of expansion of Canadian oil sands production does not replace even one year’s decline in production from existing conventional crude oil fields. At the same time we can note that it is doubtful if, in 2020, there will be sufficient refinery capacity to handle 3.2 Mb/d. 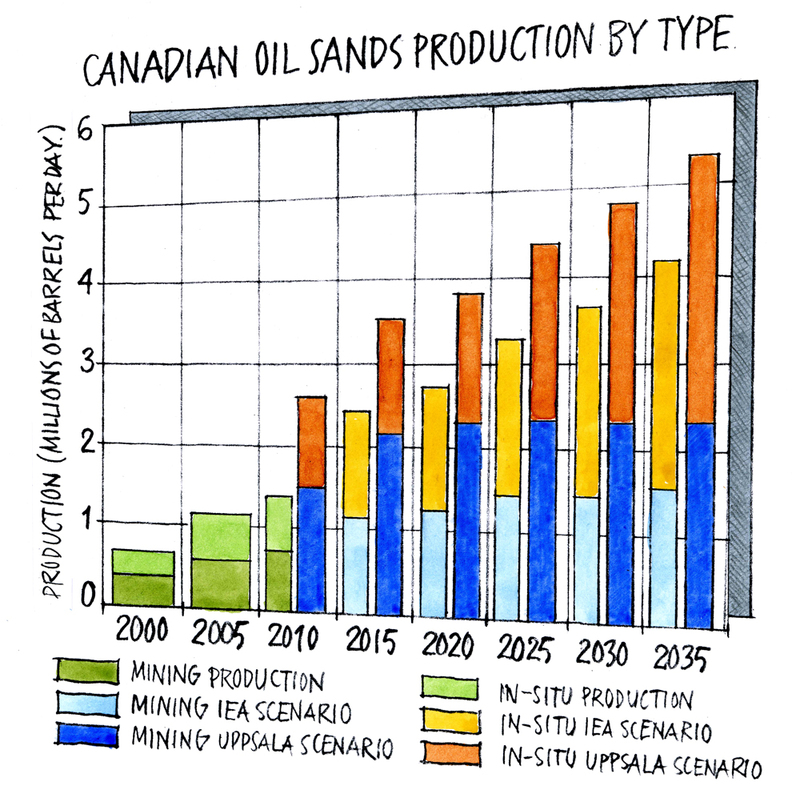 Canada’s oil sands will not stop Peak Oil.